E17 short for Enlightenment 0.17 has been officially released after a whooping 12 years of development. E17 is a light weight Window manager / Desktop that runs on Linux/Unixes. It has been developed from the grounds up which includes its own libraries. The libraries behind Enlightenment are collectively referred to as EFL (Enlightenment Foundation Libraries), each with a specific name and purpose. The window manager is a lean, fast, modular and very extensible window manager for X11 and Linux. 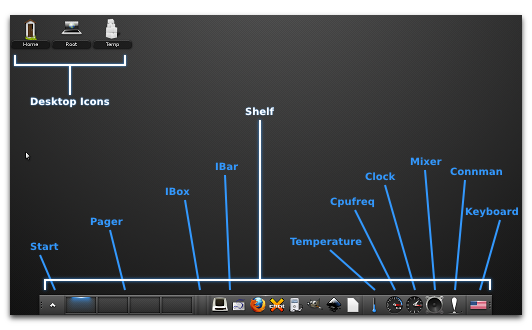 One of the oldest window managers around - barely younger than KDE. Lots of configurations and options. You can tweak just about any aspect of E17 via its settings dialog. Lean on memory usage.Will run easily on a device with very little memory as well as on a PC with the latest hardware. The suggested minimum RAM required for a full Linux system + EFL application is 16MB, but you may be able to get by on 8MB. For full functionality 64MB or more is suggested. Cross platform. Currently E17 runs on Linux and Unix variants. But it can be ported to run on Mac OS X and Windows platforms as well. Enlightenment libraries (EFL) already power millions of systems, from mobile phones to set top boxes, desktops, laptops, game systems and more. An E17 install on the exact same system as Unity on Ubuntu, simply replacing Unity can save you 200M of RAM. Not to mention be snappier and more responsive. You run fewer processes since E17 now handles being the panel, file manager, window manager and compositor (and more) all at once. At present, if you want to install and run E17 on your Linux distribution, you will have to download the source and compile it yourself. However, if you are willing to wait a bit, the next version of your Linux distribution will have E17 packages in its repository. You may read in much more detail the features of E17 on Enlightenment website.